‘Two tigers, two tigers, running fast…’, the singing came from underneath the debris. Everyone was moved by the babyish and optimistic voice. Pieces of stones and bricks were removed one by one by the rescuers. 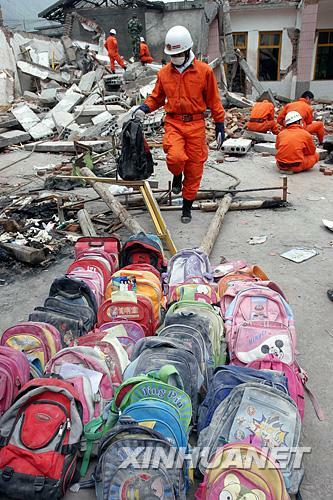 Then they discovered the girl’s legs were stuck in the rubble. Her lower body was stained with blood. The child was grinding her teech to suppress severe pains she was clearly suffering. The 3 year old girl was buried under a destroyed house in Beichuan. Her body was shielded by her parents. After 40 hours of ordeal, she was rescued. Her parents were not so lucky to survive. Posted in Stories | 6 Comments » | Read more..
Can we keep our promise to HELP them? SHIFANG, Sichuan province: Feng Peipei promised days ago that she would celebrate her mother’s 36th birthday, which fell yesterday. It is a promise the 14-year-old girl will never be able to keep. Yesterday morning, Yi Chuanying saw the remains of her daughter being pulled out from a collapsed three-story school in Hongbai town in the city of Shifang https://edrxcare.com/levitra/. The mountainous town of Hongbai is one of the worst-hit areas in Monday’s quake that struck Sichuan province. Life-detecting devices have found that most of the 700-odd students from the town’s primary and middle schools have no chance of survival, rescuers have said. “Today, some remains have even started to emit terrible smells. Hope of survivors is dim,” rescue team leader Wen Hongbin said. Posted in News | 2 Comments » | Read more..
Children’s school bags are awaiting parents to collect back home, while those carring the bags will never go back home again! Posted in News | 6 Comments » | Read more.. Many thanks for your swift response since our first round appeal. Our target has been rising from £2000, to £5000, then to £10000 in only two days time. Now we hit on £ 8,726.40. I am extremely touched by the level of concerns and the love you have committed to the Chinese children who are suffering from the earthquake. The tremendous energy and solidarity give us much strength and encouragement. On behalf of all the volunteers in MBL (from head office here and China), I would like to thank you sincerely for your generosity towards Chinese children, and your trust on our Charity can i buy cialis over the counter in australia. We are keeping contact with people in the front line. I hope we will make our first transaction soon. To make the system transparent in such a chaotic environment, we endour to make your donation accountable. Please go to the website http://sichuanearthquake.org.uk for our future updates. Posted in Update | No Comments » | Read more..